I just picked up a nice little pair of erikundi, small little shakers a little like maracas. These are also called caxixi in Brasil. I got them from a Ghanaian who was selling some imported artworks and instruments from Africa. I was planning on making my own set, but these were so nice, better than I could probably make. 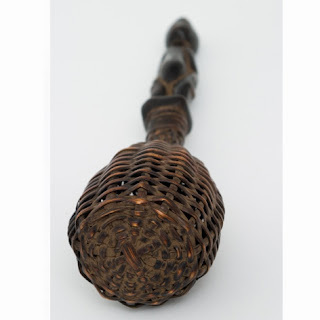 This particular set is made of woven reed or grass with a leather bottom. I have seen the bottoms made from pieces of gourd shell as well. I don't know what is inside could be a variety of things. Erikundi are not traditionally an instrument used in rumba. 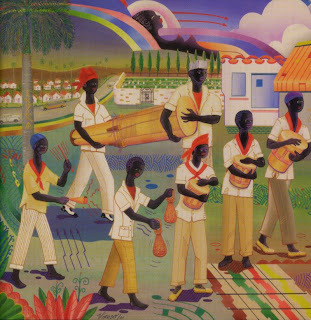 In Cuba they are most closely associated with the Abakua tradition. 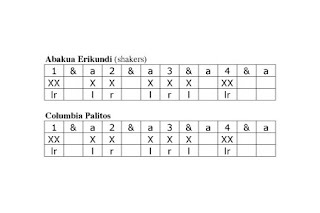 However Abakua has a strong relationship to rumba, and the erikundi pattern played in Abakua can be seen in the palitos / guagua pattern in Columbia, so the vestigial remnants of Abakua are retained in Columbia but transferred to a different instrument. This particular pair that I picked up is a little on the large and louder side, which is what I wanted. They don't sound like maracas which have a fuller sharper sound, nor do they have the sound presence of a shekere. These erundi have a little more subtle sound, just enough to be heard and drive the rhythms, but not overpowering. They will definitely give my abakua a distinctive sound, which is what I wanted. They are very well made with attractive colors and I'm happy to have been able to purchase them from an independent African importer. Two new guaguas / catas just completed. Buying a set of congas.